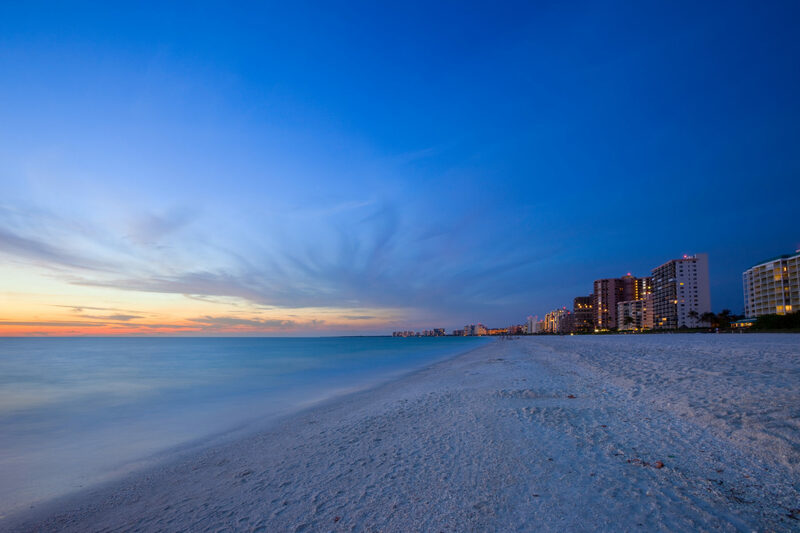 As a regular visitor to Florida’s Marco Island, I’m continually drawn back by the natural, unspoiled beauty of this gulf escape. One of my favorite activities when I visit is shell hunting — whether as something to enjoy with the family or during a relaxing stroll on my own. I now consider myself a seasoned Marco Island shell hunter, and I have a go-to itinerary for finding a bountiful variety. 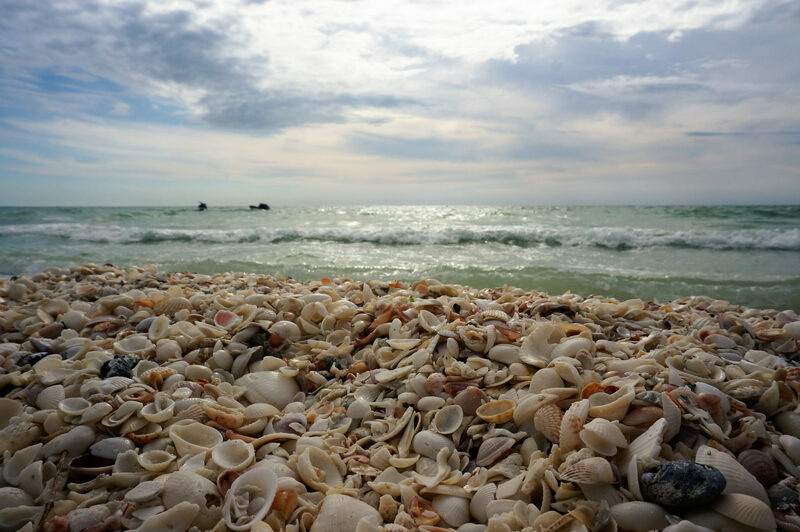 The beaches on Marco Island are a haven of gorgeous — and often rare — seashells; you just need to know where to look. I start my search at Tigertail Beach on the north side of the island. 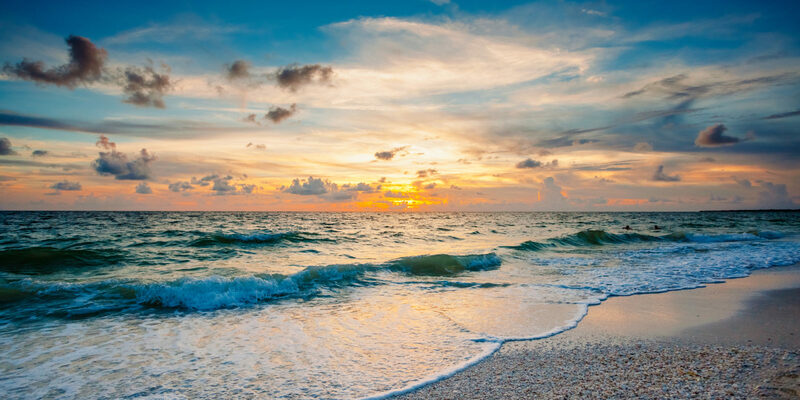 This pristine public beach offers some of the best shelling on the Gulf Coast — plus restrooms, a concession stand, kayak rentals and a playground for the kids. 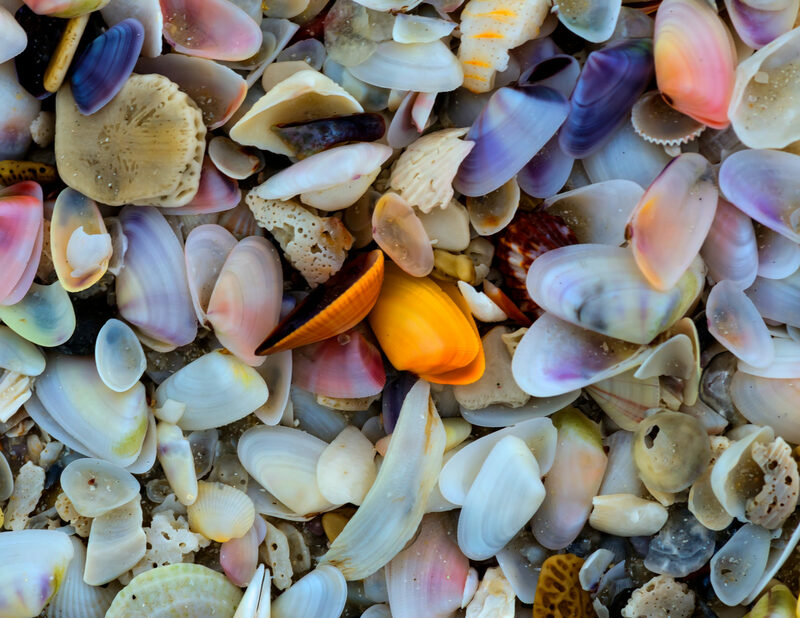 Over the years, I have discovered a vast array of beautiful, exotic shells during my shelling excursions here: worm shell, calico scallop, lightning whelk, moon snail, olive shell, fighting conch, sand dollar, starfish and horse conch, just to name a few! Collectors often seek junonia shells, a rare find on Marco Island. I’ve yet to snag one of these coveted shells, but always have my eye out for them! While hunting for mollusks at Tigertail Beach, I’ve found that the local wildlife is a pleasant distraction. 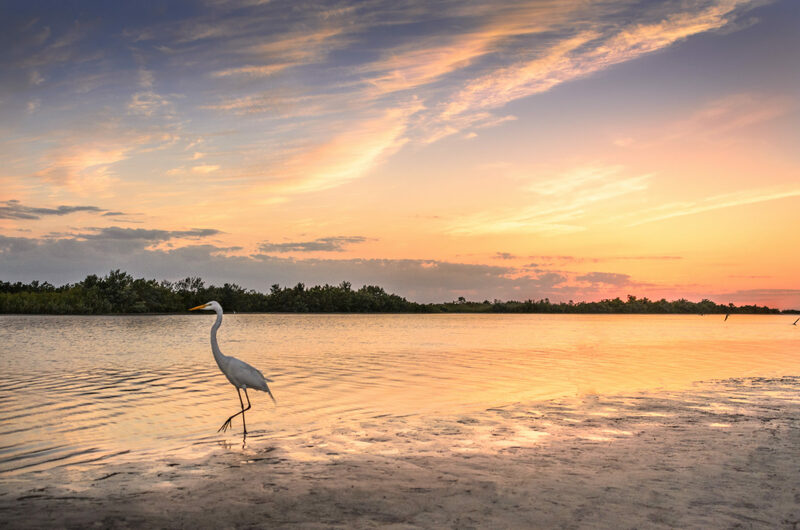 The area is a remarkably unspoiled haven for nesting shorebirds — that’s why it was dubbed the “best all-around birding location” by the Great Florida Birding Trail guide. I’m always delighted when I pause my shelling and catch a glimpse of a bald eagle soaring above or sea turtles scurrying into the ocean. Next, I typically continue down the long walking path to the lagoon, smack between Tigertail Beach and the Big Marco Pass Critical Wildlife Area. The sheltered salt-water lagoon is home to plenty of horseshoe crabs and fish, and my kids love to explore the calm waters while I continue my search for shells. From the lagoon, I use my water shoes to trek across the shallows to Sand Dollar Spit, a soft, sandy beach on the lagoon’s far side. This area is known for plentiful sand dollars and urchins, and during the spring it harbors many sea turtle nests. Looking for other nearby shell-friendly spots to visit? I also like South Marco Beach (open to the public as well). Or you can drive north to Sanibel Island. Additionally, local boat tours stop at sandbars in the area, which are ideal locations for shelling. I usually go shell collecting during low tide. But — if you can make it out after dark — an even better time to go is during a full moon. Scientists say the gravitational pull of a fully illuminated moon may churn up more seashells on the beach — a win for shell lovers! You can also expect more shell activity right after a big storm, when the sea stirs the sands and loosens debris. Walk on the beach between the water and the tideline, which is where seaweed tends to clump on the sand. This is where I find my best shells! Collection of or injury to live shells is against the law on Marco Island, so be careful to follow the local laws. If you pick up a shell and suspect it is alive, return it to the water immediately. Not sure how to tell if a shell is alive? Living sand dollars are often a darker brown, half buried in sand and a bit fuzzy. A living sea star tends to wiggle its feet when picked up. Living sea urchins will move and wiggle when touched. Ditch the plastic bag or bucket in favor of mesh bags, available at many local shops. The mesh material helps shake off sand and excess water, and this makes shells much easier to transport. To prevent damage, I recommend using one container for smaller, more fragile shells, and a mesh bag for larger ones. Rinse your shells in freshwater. Soak shells overnight in a weak bleach-water solution. Scrub shells with a wire brush to get rid of unwanted dirt or debris. Allow the shells to dry, and then use a cotton ball soaked in mineral or baby oil to bring out the shell’s natural shine. Curious about what you’ve found? The Bailey-Matthews National Shell Museum has a free online Southwest Florida Shell Guide. The Museum also offers guided beach walks for shell enthusiasts. Julie L. is a travel journalist living in New England.